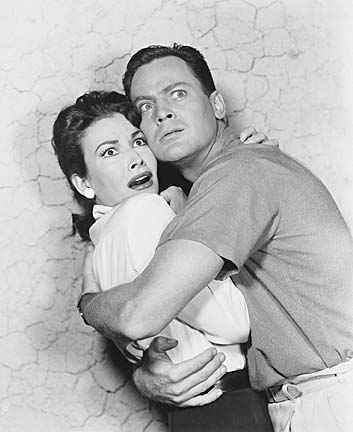 This week's recommend movie is one that is at the top of my favorite sci-fi movie list, and one I voted for each year in the Rondos as most deserving of a dvd release - I'm talking about the 1955 8-legged classic, Tarantula. Directed masterfully by Jack Arnold and starring my favorite actor, John Agar, this one is a true Universal classic. I almost got to host this one last year, as my program director was offered a Universal package of horror films for me to host. Unfortunately, the funding wasn't in place to purchase the rights, so we had to pass. But Tarantula was in the list of films I'd have gotten to host... oh well, as Max Smart would say, "Missed it by that much!